are challenged and reshaped and where employees share geographically dispersed workspaces. how to better engage your employees in line with the changing face of your office. The answer lies in the very concept of the ‘modern workplace’. A redefined workplace calls for more effective collaboration. You must already use applications like Microsoft® Yammer and the wider Office 365 toolset. And if you don't, you should. Yammer is designed to offer to geographically dispersed employees a much needed virtual platform designed for collaboration. And while change is great, it can often result in a lot of communication falling between the cracks – a missed idea, a missed business opportunity. An overflowing inbox and a widening multi-app environment don’t help. what their peers are up to and that generates ideas in the moment? with the power of visual. Digital signage is a powerful visual communication channel that plugs in right at the heart of modern workplace transformation. SpinetiX brings information to employees using digital signage. Large, easy to read screens display real-time information from your everyday collaboration tools that is relevant to the mass internal audience. Put these screens in well-trafficked locations, and suddenly you have a common canvas of useful info that is difficult to miss. 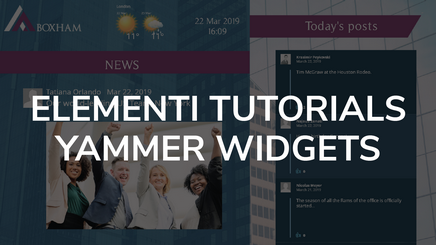 Our software Elementi includes pre-built connectors we call widgets. With widgets, you create stunning screen content in minutes that auto-updates and securely connects to Microsoft® Yammer and your other Office 365 applications. A bright screen displaying real-time information from Yammer keeps the conversation going and provides fertile ground for ideas to grow and turn into business opportunities, no matter how far the head office is. A streamlined highly visible information flow creates opportunities for more cross-functional conversations on the go. It’s all about 'conversations' that workers are accustomed to as relevant content appears directly on screen. There is no time spent on navigating and searching within apps on devices. A digital display connected to information from tools your employees use daily amplifies in real-time your internal communication – no matter how far they are from the head office. It's no longer tough to figure out where to turn for information and help. The digital display is a window to your company culture that employees at even remote sites see daily. Digital signage also helps drive visibility to the platform and reach people who would otherwise never open Yammer. Ideas and feedback from across the company are visible and explored by employees - including ones who don’t usually work together. Displaying such information on a digital screen at the right location is a simple idea but really gives a window into the backdrop of your remote colleagues’ working day. It also helps you nurture discussion by bringing the context of Yammer on screen. Employees are always taking pictures with their phones, of them, client visits, their teams. Through digital signage, all that image content is sequenced and published to the whole company. Built-in tools within Yammer provide for moderation if desired. Digital signage together with photos and posts from Yammer help you showcase internal innovation and achievement from across your organization and build on the work of others. You don’t need yet another system. At SpinetiX, we believe in integrating into what you already have. Elementi and its widgets are purposely built for centralized distribution to any number, combination, or size of displays. Arranging content is done via simple drag-and-drop and avoids having to depend on agencies for content design. Content on your screens automatically updates while your employees continue using Yammer as usual. Get started with the Yammer widgets and Elementi today. Step 2: Install it on your PC. 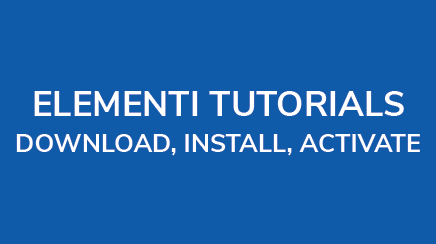 Watch the video below to learn how to install and activate Elementi. Step 3: Create your Yammer screen. Watch the tutorial video below to learn how to create your Yammer project in Elementi. See more tips on our Wiki. The trademarks and logos of other companies used here are to communicate that SpinetiX products and solutions integrate with these companies specified products and solutions. For the exact details of these integrations please contact SpinetiX. Unless expressly specified for a particular company, SpinetiX disclaims any other association, affiliation, sponsorship, endorsement or approval by these companies of SpinetiX or SpinetiX’s products or solutions.